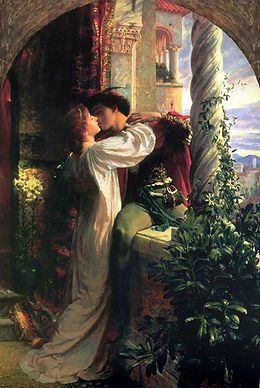 Shakespeare writes the novel Romeo and Juliet in the XVI century. The prologue is the part which begins the play. Context> The families of the two lovers are ennemies. Their quarrels are extremely violent. Their children fall in love but their parents hatred will cause their death. This death will bring peace (" mend"). The Kinsman's Juliet if they see Romeo they killed him. Juliet is enlightened whereas Romeo is in the darkness. Juliet has the dominant role. She is above ( a higher position). She is out of reach. Around them they are trees. The orchard symbolize intimity. The love of Romeo and Juliet is new. It's as a fruit which ripe.